All parties must end sometime! All our items on marketplace have been marked down at least 50%, and will remain available through October 31st, leaving only a hangover, memories, and some stains that will probably never wash out of the carpet. Don’t miss out on your last chance at these items! Delia is a delightful combination of a flirty short dress and classic vintage fabric designs. The darker sides tease the eye with intriguing details, creating a slim silhouette in the middle, the subtle pattern visible for only those who let their gazes travel over it longer. This is the perfect dress for daring club nights, promising dates or fancy summer evenings. The dress comes with a colour-change HUD of twelve colours, so you are actually getting a full pack of dresses at the price of one! This is a rigged mesh item that moves with your avatar. The sizes include all the five standard sizes and a fitmesh size. Please try the demo. Theda jewelry set carries a luxurious vintage vibe hailing all the way back to the ancient Egypt. It also fits the Art Deco design perfectly and can be worn for either period style or roleplay. The precious gemstones can adorn a sophisticated lady, a priestess of old or simply a woman with a love for stunning showpieces that hold a story. The jewelry matches perfectly our earlier release of Theda shoes, if you wish to form a complete look. 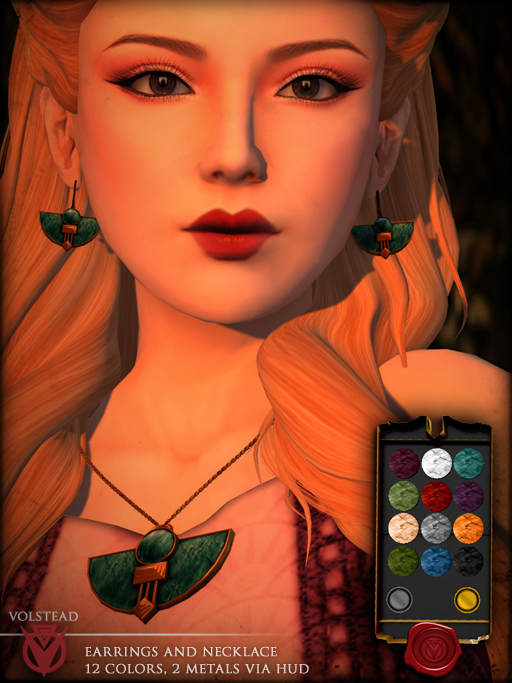 The set includes a necklace, earrings and a colour-change HUD for both. The HUD controls the colour of the gemstones and the metals, there’s twelve colours for gemstones and two for the metals. The jewelry is unrigged mesh and therefore easy to re-position and resize as you wish. Theda shoes are vintage luxury on its very highest heels. The silk fabric gleams as bright as the rich metals and gemstones within the Egyptian-vibed decor. These shoes are guaranteed to walk you into adventures, into foreign locations, into fancy celebrations and enchanting situations. Try them on, see if you dare to walk where they are going! The shoes include a colour change HUD that has twelve fabric colours, twelve gemstone colours and silver and gold metal options, so you’re actually getting a full pack of shoes at the price of one! These shoes are unrigged mesh and therefore you can resize and reposition them as you wish. They are intended for Slink’s high feet only. The Slink feet are not included in the purchase. Please try the demo. Marlene is a combination of the sheen of the luxurious fabrics, Art Deco styled shapes and a classic silhouette. The dark overskirt holds slits to let the more colourful fabric peek through in a teasing manner, just enough to match the stunning details of the top. The extra layers of fabric make this a winter fitting dress, the dark tones adding a more official celebration vibe to it. This is a rigged mesh item that moves with your avatar. The sizes include all the five standard sizes. Please try the demo. Adrienne is a fabulous pair of shoes designed to decorate and adorn your feet. The vintage pattern is framed beautifully with either silver or gold to transform the delicate shapes into a stronger attitude. The slightly raised platforms have an intriguing metal detail to catch your eye and to raise it higher into the straps embracing the feet. With these shoes you can walk into any party or celebration, from an evening in a jazz club to the red carpet. The shoes include a colour change HUD that has six colours with silver metal framing and six with gold metal framing, so you’re actually getting a full pack of shoes at the price of one! These shoes are rigged mesh and intended for Slink’s high feet only. The Slink feet are not included in the purchase. Please try the demo. Vera is a stunningly classy dress of vintage design and luxurious fabrics. Its elegant silhouette is brought to life by the vivid pattern, its official vibe tempered with the tease of legs visible through the sheer fabric below the knees. This dress can be dressed up to the grandest of parties, to red carpets and cocktail gatherings, but it can also be the most jawdropping thing you have ever worn on the date night: the choice is yours!